I want to take a moment to thank everyone who has stopped by over the last two weeks for the Titanic Week posts. I would also like thank all of our guest posters who have shared such interesting things with us and helped round things out. I would also be remiss in not thanking Alex for the absolutely fantastic buttons. She really is talented! And, my thanks to Ana, Marg, and Teddy for helping out with posting. 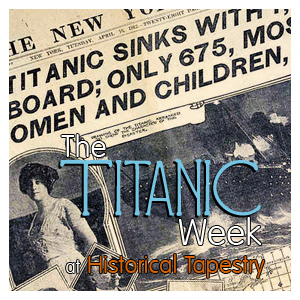 In case you missed anything, here are all the posts that have been shared over the last two weeks for Historical Tapestries Titanic Week. Fantastic job on this! I wish I could have participated more! Thank you for such a carefully linked post. Makes it so easy for us the readers. Wonderful posts these last two weeks. I especially loved the list of Titanic historical fiction. Thank you. Yes, thank you again! You did a terrific job - a wealth of information - I looked forward to each post and learned a lot in the process.